Britain’s devolved governments of Scotland, Wales, and Northern Ireland want a bigger say in Brexit negotiations with the European Union, but Prime Minister Theresa May is determined to lock them out. 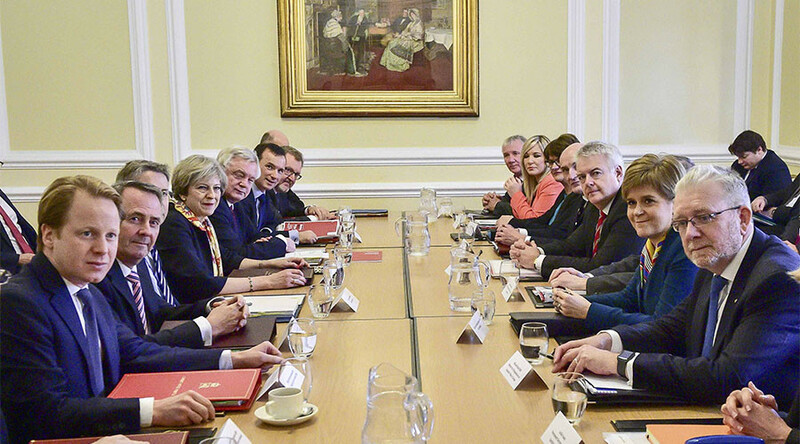 Leaders of the devolved governments pressed Prime Minister May on the issue at a meeting in Cardiff, where Scottish and Welsh representatives produced plans that would allow them to retain access to the single market. The PM has said devolved governments will not be given a decisive role in Brexit talks. Last week, the UK’s Supreme Court backed May’s stance, ruling that the Scottish Parliament and Northern Irish and Welsh Assemblies could not hold separate votes on Article 50. Ahead of Monday’s meeting, Scottish First Minister Nicola Sturgeon said time was running out for Westminster to “heed the voice of Scotland,” according to BBC News. She added the meeting would be the most important since the EU referendum. “It comes at a crucial juncture, with the clock ticking down to the triggering of Article 50 and with, so far, no sign whatsoever that the UK government is taking Scotland's position remotely seriously,” Sturgeon said. Monday’s talks also saw Sinn Fein’s new leader, Michelle O’Neill, speak out against the government. “The Tory government have effectively set aside the democratic process to pursue their own narrow political agenda. We need all of those opposed to Brexit to stand together,” she said. Welsh First Minister Carwyn Jones called on May to uphold promises made during the referendum campaign that Wales will not lose out on funding as a result of Brexit. Jones spoke with May ahead of the meeting, where they discussed concerns over single market access. The PM said: “We will not agree on everything, but that doesn’t mean we will shy away from the necessary conversations and I hope we will have further constructive discussions today,” she said. “We have also had the Supreme Court judgment which made clear beyond doubt that relations with the EU are a matter for the UK government and UK parliament.